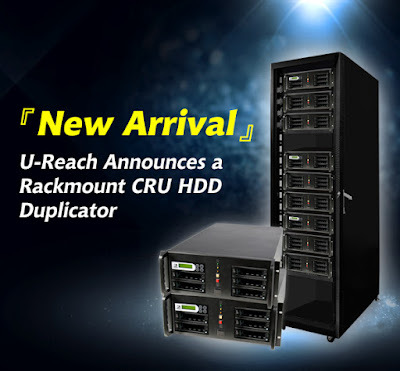 In 2015, U-Reach has responded to digital cinema duplication demands by cooperating with the largest hard drive enclosure company-CRU- to announce a brand new CRU HDD duplicator: The KV Series-Rackmount CRU HDD Duplicator. CRU hard drive enclosures have been widely used by major firm publishers such as Disney. U-Reach has designed the CRU hard drive duplicator for high speed and reliable duplication of CRU hard drives. The duplicator supports DX115 DC Carrier and can copy between 1-254 target CRU HDDs simultaneously without speed degradation. The U-Reach KV series HDD duplicator can be installed in a server closet or hooked up to another unit to expand its duplication capabilities. With log reports and speed filtration functions, the KV series can meet almost all requirements in HDD duplication. For more information please check out U-Reach products and solutions at www.ureach-usa.com.